I'm a huge fan of Too Faced products and ever since they became available at Debenhams I've been even more of a fan - it's nice to finally be able to get hold of them easily! This Sweetheart Blush is just all kinds of adorable, and the heart-shaped packaging would just look beautiful sitting pretty on my dressing table. Slogan swimsuits are everywhere at the minute, but with some of them costing in the region of £60+ (I mean, really?!) I'm all about looking for the cheaper alternatives. 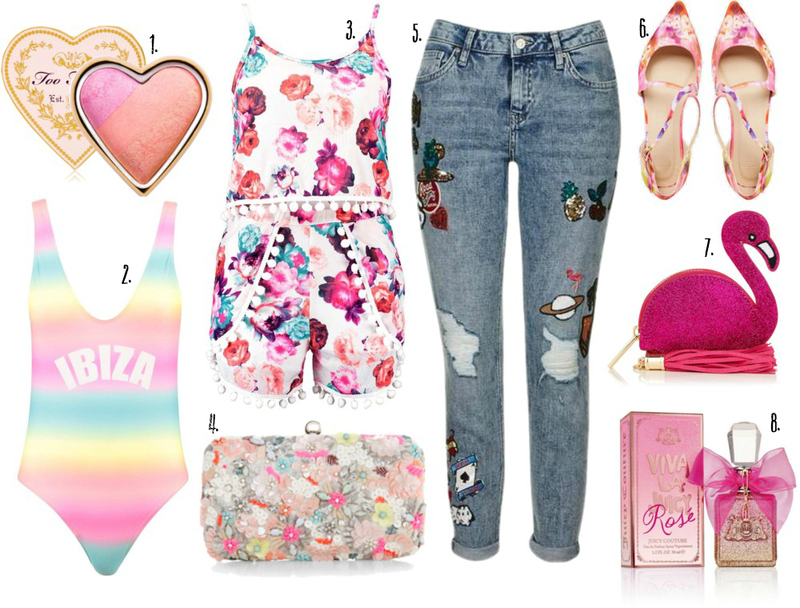 I love this pastel rainbow 'Ibiza' print one from Boohoo, and I've seen some gorgeous ones on Missguided too. Definitely worth shopping around for! Another Boohoo bargain, I can totally see me wearing this on the beach this summer. It's got everything I love - pom poms, floral, and it's a co-ord. What more could you want? I think it'd look amazing with a tan too. My favourite season to have a look at Accessorize's selection of beautiful embellished bags is always summer, and this year they have a seriously stunning selection. This neon hardcase clutch bag is definitely on the pricey side, but it's one of those investment pieces that will last forever. Quirky embellished jeans are everywhere right now, and I'm desperate to get my hands on a pair. I recently spotted these sequin badge jeans on Topshop and fell in love. Whilst they might not be everyone's cup of tea, I think they'll look amazing over summer with some cute sandals or trainers. ASOS is fast becoming my go-to when it comes to cute ballet flats, and when I spotted these I thought they just screamed summer. With a gorgeous floral print and cute crossover straps, I think they'll look gorgeous with a tan. Skinny Dip never fails when it comes to super cute, quirky pieces, and as soon as I saw this coin purse I fell in love. It's glittery, it has a tassel, it's flamingo for crying out loud... what more could you want from a coin purse?! I've been looking for a new fragrance for summer and I think I've found it with Juicy Couture's Viva La Juicy Rose. I'm obsessed with rose scents, adore all things Juicy Couture and have fallen head over heels for the packaging on this. Whilst I've not actually smelt it yet, I'm pretty sure I'm going to love it. What summery bits and pieces are you currently lusting after? Let me know!